The Hermit (IX) embodies the quest for knowledge and enlightenment through self-reflection. The ninth Major Arcana speaks to the power of solitude during this personal journey. 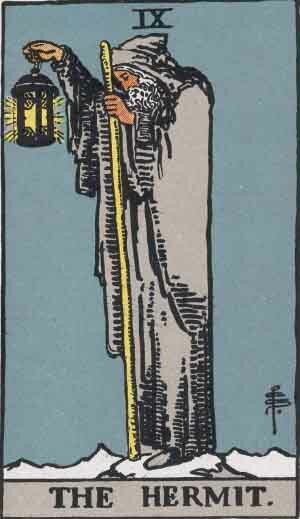 The Hermit tarot card features an old man standing on a mountain, holding a lantern in his outstretched hand and a staff in the other. The mountain symbolizes accomplishment and success, while the lantern represents his search for truth and knowledge. Inside the lantern is a star — the Seal of Solomon, a symbol of wisdom. His staff represents power, authority, and signals the importance of his journey. The man depicted on this card is alone, in an isolated place. He has embarked on a long journey, yet his lantern and staff show that he is determined to stay on his path. He is at peace with his solitude in this search for answers. The Hermit is also looking down from the mountainside, which indicates that he is willing to share his wisdom with those that seek it. The Hermit is a person who is wise beyond their years and enjoys their solitude. They are constantly searching for knowledge, truth, and a deeper connection to the spiritual plane. However, the introspective nature of the Hermit makes him unduly sensitive to criticism. The upright Hermit signifies that you are in a period of self-reflection. Taking time for yourself will allow you to find enlightenment and a better sense of your values. 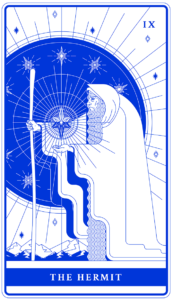 The Hermit card indicates that you are primarily concerned with self-love. You are on a personal journey — through meditation and contemplation, you will learn to appreciate yourself for who you really are. During this spiritual quest, spend time thinking about how you see yourself and recognizing your personal strengths. Let go of old emotional hang-ups and unresolved conflicts, as the Hermit indicates they will interfere with current or future relationships. Search for truth by addressing any emotional baggage that you or your partner may have in order to strengthen your bonds and reach enlightenment together. You are searching for answers in your career. This could mean questioning whether your job is right for you or if you should consider a career change. The Hermit indicates that now is a good time for truth-seeking and personal development. Reflect on whether your current job aligns with your values or how you can best solve a problem at work. The solution may involve sharing your knowledge with colleagues. You should be conservative with your money for the time being. Invest in yourself and resist the temptation to spend on outward displays of wealth. Avoid material distractions and recognize money’s true rational purpose. Taking time for yourself will give your body a break and relieve stress. Try meditation, daily walks, or yoga to ease your anxiety and sleep better. Instead of enjoying your solitude, you have isolated yourself so much from the world that you feel deeply lonely and trapped in your own mind. Reach out to others to avoid becoming lost on your search for understanding. A worrisome sign for a couple, the Hermit means that one partner is withdrawing from the relationship and craves time alone. If this is you, be honest with your partner and respect your needs. If it’s your partner, honoring their need for space will give the relationship a future after their journey of soul-searching is over. If you are single, the Hermit represents your loneliness and longing for companionship. Talking about your desires with a friend may help lead you to love. You are isolating yourself too much at work. Seek out a mentor or career guidance from someone you trust. The Hermit may also be a sign that you will soon be let go or fired, so take this time to evaluate your career options. You are putting too much focus on money, and not enough on your personal values and relationships — think about where this strong desire for money is coming from. These pressures may be eased by taking a break from the materialistic demands of society. Keeping your emotions bottled up is negatively affecting your health. Share any mental or physical problems you may have with a medical professional or someone you trust. In the past position, the Hermit indicates that you are coming out of a period of isolation. Often this card shows up after earning a degree or being single for a long time. The Hermit in the present position means that you are going through a period of solitude and contemplation. This could be a sign of a recent breakup or that you are feeling alone in a relationship. If you’re in a relationship and you draw the Hermit in the future position, be warned that a separation is likely. This may be a blessing in disguise though, as it can mark the end of a destructive relationship or the beginning of a period of personal growth. The Hermit emphasizes the importance of solitude and serves as an encouragement to focus on yourself. When combined in a reading, it points to an area of your life where time to reflect or act alone is necessary. The Hanged Man is concerned with justice and letting go. When paired with the Hermit, it means that your mind is fixated on the opposing forces of right and wrong, and that you are torturing yourself over decisions made long ago. Learn to forgive yourself as the world and spirits already have. This combination is a strong signal that going out on your own will lead you to success. This is an opportune time to start your own business or break free from a toxic relationship. A heartbreaking combination, the most isolated card of the tarot meets the most united. Together, the Hermit and the Lovers can only mean one thing: breakup. This duo clearly indicates that a separation is on the horizon. The Star is a sign that your life is following a divine plan and that you are making the world a better place. When combined with the Hermit, these cards mean that you time alone will bring success and enlightenment. This may take the form of a work of art that was created in isolation. As a symbol of introspection and searching, the Hermit is a maybe. It incites you to seek the answer within yourself. The one exception to this is if your question was in regards to being alone, in which case the answer is yes.